Is there anything better than a delicious, fresh waffle for breakfast? You can make your very own waffles at home with a waffle maker. Whether you desire round, square, thick, or thin waffles, there’s an option for you. Here at ReviewLab, we dug deep to select our top picks for waffle makers. Our in-depth research helped us to narrow down our choices, which you’ll find below. You’ll find a variety of waffle maker types, from multi-serving options to traditional cast-iron models. We also put together a concise buying guide to help you understand the features and variations between waffle makers. You can narrow down your choices further by taking a look at the individual product reviews. Read more about our methodology. The Breville Smart waffle maker features Waffle IQ, which sets it apart from other units on this list. This nifty feature makes the cooking process a no-brainer and results in consistently well-cooked waffles. It can also provide up to four servings at a time, which is great for those feeding a family. Our runner-up pick is a reliable and affordable waffle maker that evenly cooks a single serving. It creates waffles that won’t stick or break apart. Like the waffles it creates, the machine won’t easily break down with frequent use. The Oster Belgian Waffle Maker is a great budget option that makes good waffles and is very easy to use. The no-frills design utilizes simple indicator lights to guide the user as they create breakfast. 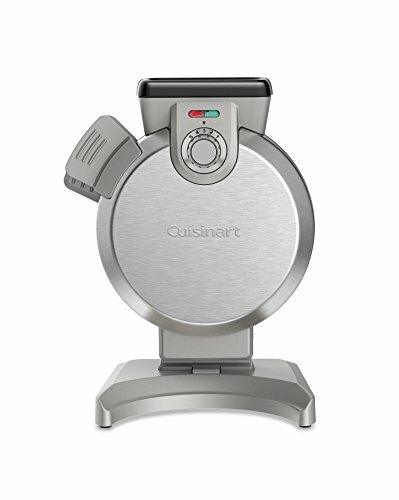 The Cuisinart Round Classic Waffle Maker is our budget runner up because some reviewers said that waffles did sometimes stick. 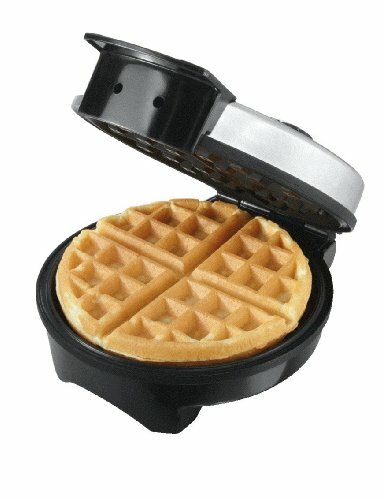 Patience is required with this affordable model, as opening it up too quickly can cause waffles to cling to the plates. Those who wait will be rewarded with delicious crispy waffles. 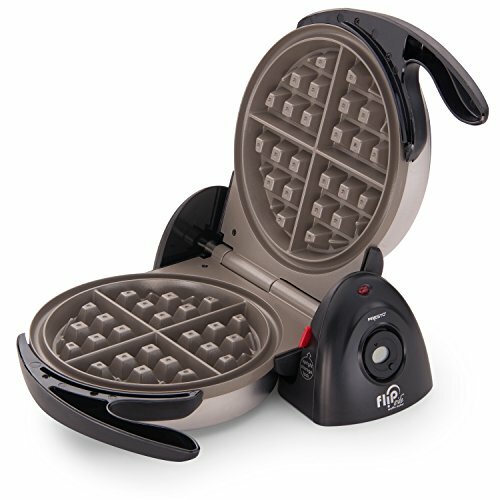 The Presto FlipSide Belgian Waffle Maker features a unique rotating design. 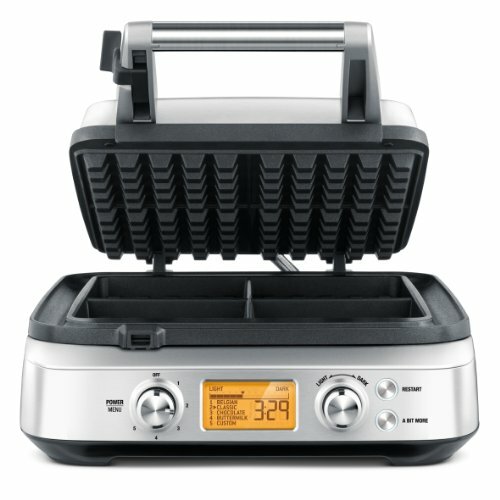 This is a good basic flip waffle maker option that heats batter up evenly resulting in waffles that are nearly always perfect. 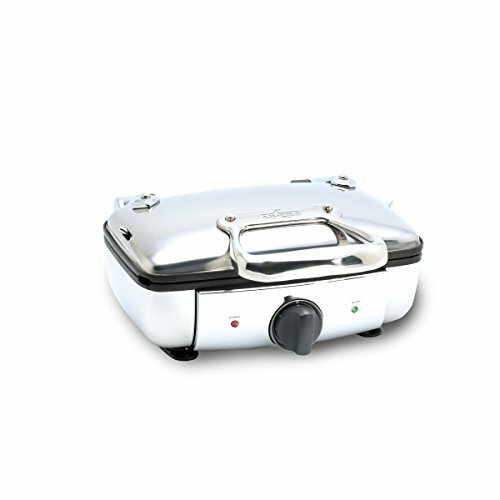 The All-Clad 99011GT Waffle Maker is perfect for families who need to feed multiple mouths in the morning. It consistently produces two servings of well-browned waffles. 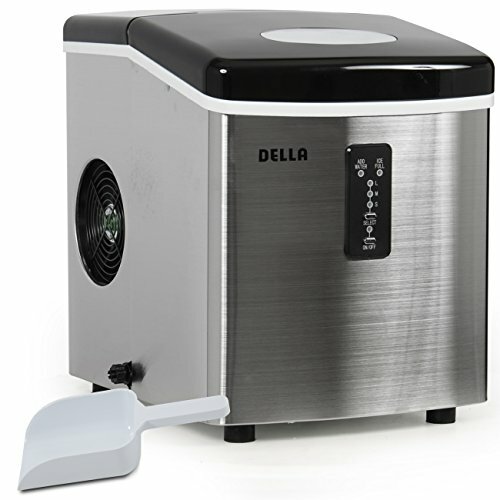 A larger option of this unit is also available for those who want to make even more waffles at a time. The Cuisinart WAF-V100 Vertical Waffle Maker’s vertical design creates less mess. Pouring in the right amount of batter is nearly foolproof. 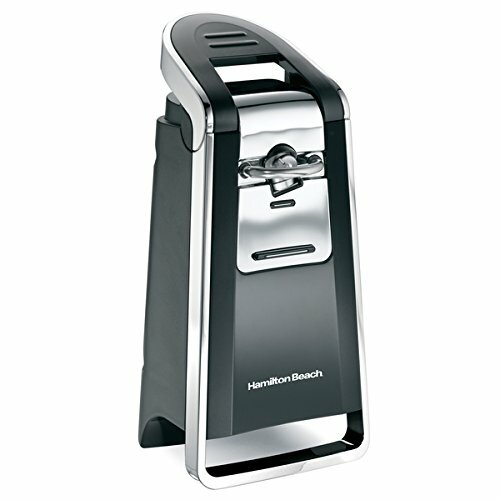 Using a vertical waffle maker is perfect for creating basic waffles and keeping messes at bay. The Useful Old Fashioned Cast Iron Waffle Iron is a good option for campers or cooks who are particularly fond of cast iron. It’s the most durable waffle maker option on this list. It does require a bit of a learning curve but needs no power source. 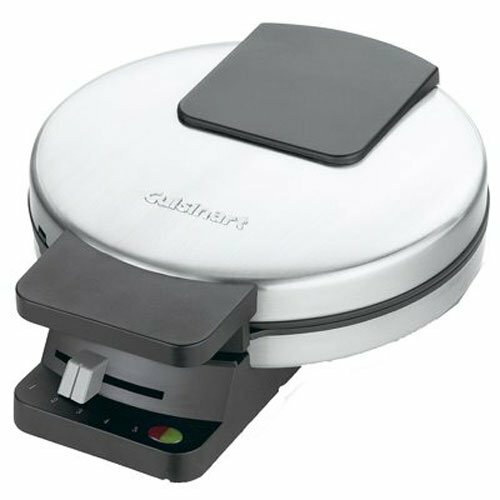 The Cuisinart Belgian Waffle Maker With Removable Plates is a versatile machine that cooks both waffles and pancakes. It’s super easy to clean thanks to removable plates and can produce multiple servings of either breakfast food. Most single persons or couples can make do with a single-serving waffle maker. With most units, even single waffles are quite large. For those with a family or a big appetite, a 2 or 4-slice waffle maker option may be more appropriate. Potential buyers may also want to pay attention to the diameter of the waffle maker to get a sense of the size of each serving. Decide whether you prefer a round or square shaped waffle, as different units will cook waffles in different shapes. Some novelty options can cook waffles in fun shapes for children or carefree adults. Pay attention to whether your selected unit is nonstick. It’s extremely difficult to pry out a waffle if it has gotten stuck on the device’s plates. You’ll end up with a mess of a breakfast. If you are concerned about Teflon or other harsh chemicals featured in nonstick coatings, look for a waffle maker that’s PFOA and PTFE free. Most units will have some sort of nonstick coating to help prevent sticking, making it unnecessary to grease or use nonstick spray on the machine. Doing so can actually have the opposite effect on nonstick coating models, so make sure to read the device instructions. In general, even the most basic waffle makers will feature indicator lights. Unfortunately, the presence of these lights often confuses users. So, let’s set the record straight: unless otherwise noted in your device’s instruction manual, the first light that illuminates lets you know that your waffle maker has preheated to the correct temperature. When the second light turns on, that’s usually a signal that your waffle is ready to eat. The most basic waffle makers come equipped with only indicator lights to help guide you in your waffle making. You can find basic waffle makers for less than $30. Mid-range options, priced between $30-$50, feature slightly nicer finishes and are generally more attractive in design. High-end units will feature more durable construction, be able to serve more than one person, and will have a greater number of features, such as audible alerts and countdown timers. The smart Waffle IQ feature of the Breville Smart waffle maker helped to secure it our spot as best overall pick. The waffle maker properly cooks waffles every time and offers customization options to users such as the useful ‘A Bit More’ function, and a darkness selector to create just the right crisp. A countdown timer also lets you know how much cooking time is left. Evenly heats and cooks. Waffle IQ function automatically figures out how long to cook your waffle. Waffles never stick. PFAO free coating ensures that food doesn’t get stuck on the machine. No spills or mess. Reviewers like that any overflow goes into the convenient moat area to prevent counter spills. Handy ‘A Bit More’ button. Users love this button, which lets the waffle cook a bit longer. Great for those who prefer a crispier waffle. Easy-to-read backlit display. The unit is equipped with backlit buttons and display. A countdown timer starts right away when the lid of the machine is shut. A knob also helps users control the darkness of their waffle. Manual can be unclear. Many reviewers don’t like the guesswork involved in figuring out the settings option. Our runner up for best overall is the Proctor Silex Belgian Waffle Maker. It has an affordable price tag and is well constructed. It also features a design that helps prevent messes from occurring. For those who are prone to using too much batter, a portioned cup is included and if that fails, an overflow area keeps extra batter in check. Simple to use. Red and green indicator lights provide a handy guide to users. When the light is green, the waffle maker is ready to go. Small size makes it easy to store. The waffle maker takes up very little space, making it easy to stow away when not in use. Low price. The quality unit comes with an attractive budget price. Comes with a convenient batter cup. Reviewers appreciate the handy batter cup included with the unit. It helps users to measure out the right amount of batter and eliminate waste. Good nonstick surface. 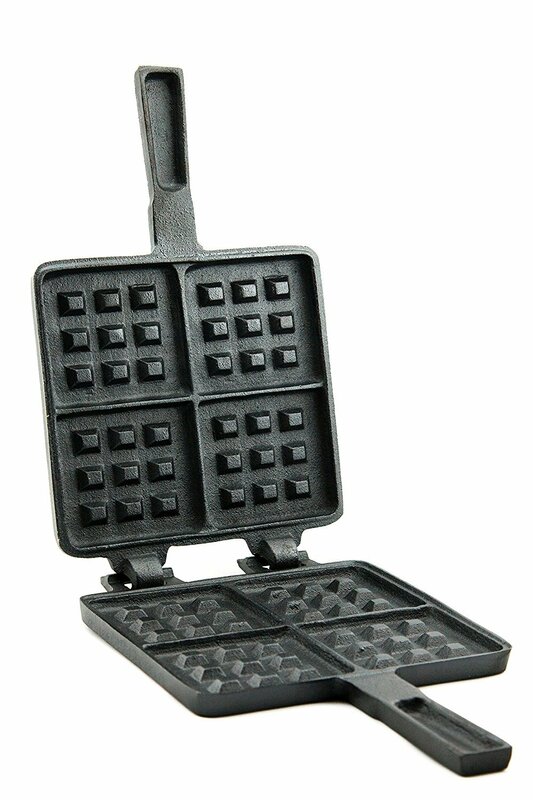 The waffle maker’s nonstick design prevents waffles from getting lodged in the device’s plates. Mess-free design. A batter overflow area helps control excess batter and a deep profile keeps batter from dripping over the sides. Very basic. This unit is well liked by reviewers but is not appropriate for those looking for extra features. Gets very hot. Careful when handling the waffle maker. Use oven mitts when opening the lid to avoid burning your fingers. The affordable Oster Belgian Waffle Maker is a no-nonsense option for breakfast lovers who want a simple way to create yummy waffles. The unit requires zero learning curve and waffles are easy to remove from the plates. Just pour in batter, wait as your waffle cooks, and enjoy your tasty breakfast item. Budget price. The waffle maker cooks just as thoroughly as other more expensive models. Easy to use. Simply wait for the green indicator light, which will alert you that the device is preheated. A simple power on button lets users shut the waffle maker off when done using it. Waffles don’t stick. A non-stick design helps prevent waffles from getting stuck to the machine. Easy to wipe clean. Reviewers like that the machine is easy to clean with a simple wipe of a cloth. Small enough to easily store. Users are happy with the compact footprint of the round waffle maker. Handles stay cool. Cool touch handles are helpful in preventing burns and eliminate the need for users to use oven mitts when using the device. Creates an uneven waffle. The waffles that come out of this unit tend to have thinner edges. No timer. Lack of a countdown clock is understandable considering its budget price. The unit runs hot. 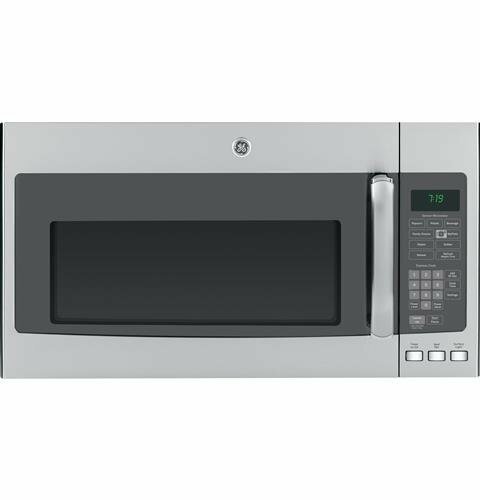 Even with cool touch handles, reviewers say that the unit does get hot elsewhere so is not a good option for those with small curious children. Durability concerns. A few users point out their concern about the unit being flimsily constructed. Our next choice for the budget category, the Cuisinart Round Classic Waffle Maker is an affordable no-frills option that quickly cooks waffles to perfection via customizable darkness settings. With a small footprint and cord that wraps, the unit can easily be put away when not in use. 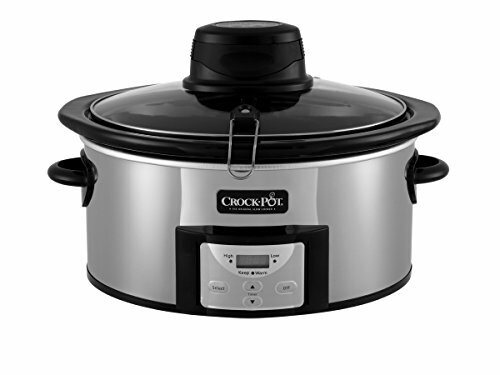 Heats up and cooks quickly. Indicators are present on the model to let you know when the waffle maker is preheated. A weighted lid ensures your round waffle cooks properly. Compact design. The round waffle maker can easily be stored away thanks to its small size and convenient wrap-cord. Barely requires cleaning. Users point out that the nonstick plates work so well that cleaning is almost unnecessary. Budget price. The waffle maker is priced appropriately and even comes backed by a 3-year warranty. 5 options for darkness. A knob allows users to control browning to get the waffle cooked just right. Sturdy construction. A sleek stainless steel lid looks attractive and is paired with a sturdy base with rubber feet that won’t slip and slide on the counter top. Waffles sometimes get stuck. It takes some practice to lift the lid at the right time to avoid sticking. Rotating waffle makers are often used by hotels at their breakfast buffets. The reason? The rotating action helps to spread out the batter and cook it evenly. The result is a crispy, evenly-shaped waffle that’s cooked throughout. This type of waffle maker is great for the cook who tends to under-fill the machine, which will sometimes result in a warped waffle. The Presto FlipSide Belgian Waffle Maker is a great option for those who have trouble spreading out their waffle batter evenly. The rotating design helps to make sure that batter evenly covers the plates of the machine so waffles come out properly cooked. 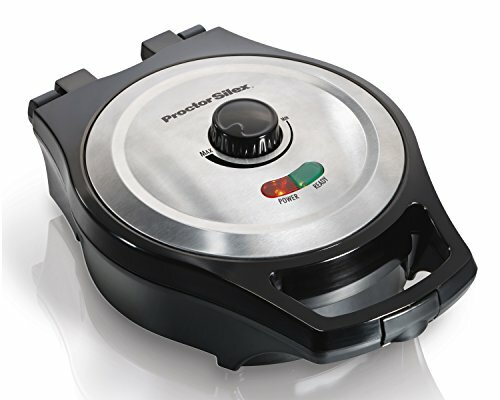 The flip-style design does not require a learning curve and even alerts you when your waffle is done cooking. Cooks waffles perfectly. The flip function ensures that waffles are cooked thoroughly and evenly. The unit’s digital display counts down and audibly lets you know when your food is ready. Vertical storage design saves space. The unit can be locked into a vertical position for easy storage. Very easy to use. A timer and audible alert help prevent you from burning your waffle and the flip design evenly spreads the batter for you. Sleek look. A stainless steel exterior makes the unit look great on the countertop and almost too nice to put away. Deep design. Deep pockets produce an authentic, thick-walled Belgian waffle. Timer not always reliable. Some users point out that the unit does not feature a smart timer. It’s simply a countdown timer, and cooking time is ultimately up to the user. Hard to clean areas. Spillovers can be hard to clean since the area where overflow ends up is not nonstick. To get bits of stuck-on waffle out, the unit requires a good scrubbing. Good for families wanting to speed up breakfast making, large-capacity waffle makers are available in 2-slice or 4-slice options. Most multi-serving waffle makers will produce square-shaped waffles and the configuration of these types of units makes it so that the waffles can easily be separated. The All-Clad 99011GT is our favorite multi-serving waffle maker. It’s a great option for the busy cook who is juggling multiple things at once in the morning. An audible beep reminds you that your waffles are done so you don’t forget them while you’re getting ready for work. The model is also easy to clean, which busy moms and dads will appreciate when they’re done serving the kiddos their breakfast. Surprisingly compact. Reviewers like that the unit can make more than one waffle but is still small enough to fit into storage. The model is also available in a 4-slice version. Safe, cool touch handles. Helps users to avoid accidental burns when using the machine. Easy to clean. 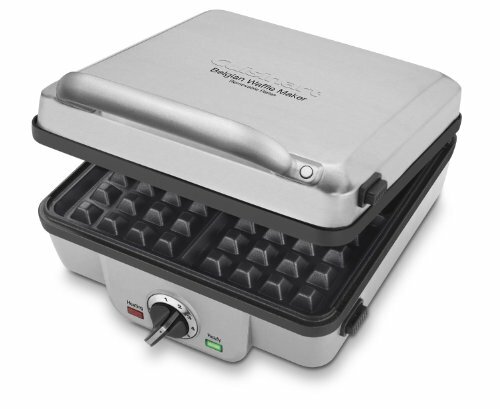 The waffle maker features a removable drip tray to ensure an efficient cleanup process. Convenient audible beep. A sound alerts you when your waffles are ready to eat. Looks great on countertop. The unit is stainless steel and for frequent waffle eaters can be left on the counter without being an eyesore. Take the guesswork out of filling up your waffle maker with a vertical unit. This type of waffle maker allows users to pour in batter from the top, to help prevent overfilling and messy spills. This type of machine can be stored in a convenient vertical position so it takes up less space, and most vertical units look good left on the countertop as well. The Cuisinart WAF-V100 Vertical Waffle Maker is a different way to make delicious waffles. Users pour in batter from the top of the unit and don’t have to worry about making a mess on the countertop. The waffle maker comes equipped with a batter cup to help you measure out the right amount but overfilling is nearly impossible thanks to the upright construction of the unit. Virtually mess free. It’s super simple to pour in batter from the top. A leak proof design ensures that overflow doesn’t happen so there’s less cleanup involved. Vertical design takes up minimal space. The unit doesn’t take up much space on the countertop and is easy to store in cabinets. Nonstick plates. Waffles won’t easily stick to the unit and come out intact for hungry mouths to enjoy. Attractive design. The waffle maker looks good enough to leave on the countertop. The sleek design doesn’t look like an eyesore if left out. 5 browning settings. Get the right amount of doneness with your waffle by adjusting the darkness control. Audible alert. A beep lets you know your waffle has finished cooking. Reviewers like this reminder as it’s especially useful for forgetful cooks. Included measuring cup doesn’t pour easily. The include batter cup doesn’t have a spout, which makes it useless for pouring batter. Use a measuring cup instead. Some reviewers find it tough to clean. While the unit is nonstick, it does not come apart for easy cleaning. For traditionalists or camping enthusiasts, a cast iron waffle maker provides an even cook and outstanding durability. These types of units are heavy-duty but because they have a thinner profile, they are easy to store even in small kitchens. They require no electricity, which makes them a good option for outdoorsy waffle-lovers. The Useful Old Fashioned Cast Iron Waffle Iron is an extremely durable waffle maker. It requires no electricity and heats up quickly when used on a stovetop or outdoor fire. A little extra care is required because of its cast iron construction but it’s sure to outlast all the other models on this list. Cast iron also heats up incredibly fast and is very easy to clean. Portable and compact. It’s a great waffle maker for those who like to camp but even for the home cook, it’s a lot less bulky than other options, and its slim profile makes it easy to stow away even in small spaces. Heats up quickly. Cast iron heats up incredibly fast, meaning your waffle gets to your plate quicker. Easy to clean. Although it doesn’t go in the dishwasher, hand washing in the sink is a breeze. No need to fiddle with cords or worry about submerging the waffle maker. 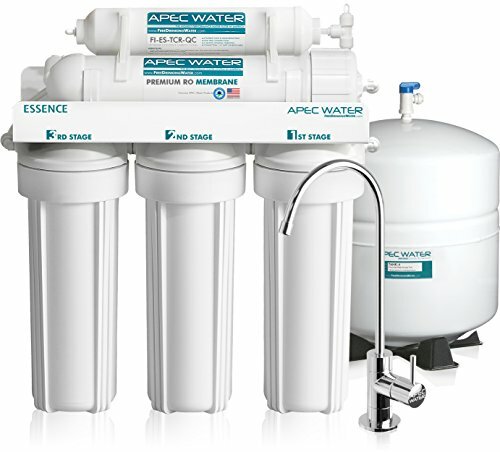 This non-electrical unit mixes fine with water. Food won’t stick. If seasoned and cared for correctly, food will never stick to the cast-iron waffle maker. Super simple to use. Just pour in batter and add heat. No need to bother with finding an electrical outlet or waiting for indicator lights. Extremely durable. Reviewers like that the waffle maker is made of resistant cast iron. If properly taken care of, it will last for years and years. Requires a heat source. You either need a stovetop or campfire to use this manual waffle maker since it requires no electricity. Not appropriate for those without a stove. Gets very hot. Be sure to use oven mitts when making waffles in this cast-iron tool. For those who love both waffles and pancakes, a multi-function waffle maker offers the opportunity to cook up both breakfast treats. Removable plates allow the user to switch up what they are cooking and they are super easy to clean. The Cuisinart Belgian Waffle Maker can feed many mouths and satisfy both waffle and pancake lovers thanks to interchangeable plates. Because the plates can be removed, cleaning up is a lot easier than with a traditional waffle maker. Simply wash by hand or put the plates in the dishwasher. The versatile unit’s plates also feature nonstick coating to ensure waffles and pancakes come out nicely. Versatile. You can make pancakes and waffles in this device. Perfect for the indecisive breakfast eater or a large family. Cleanup is super simple. The interchangeable plates are removable, meaning they can easily be cleaned without having to haul the machine over to the sink, too. The plates can also be run through the dishwasher. Large capacity. This waffle maker can make up to four servings at once, making it a great option for larger families. No sticking. The removable plates are nonstick, so waffles and pancakes slide off easily. Loud alert when waffles are cooked. An easily-audible beep lets users know when the cooking process is complete. Auto-start timer. 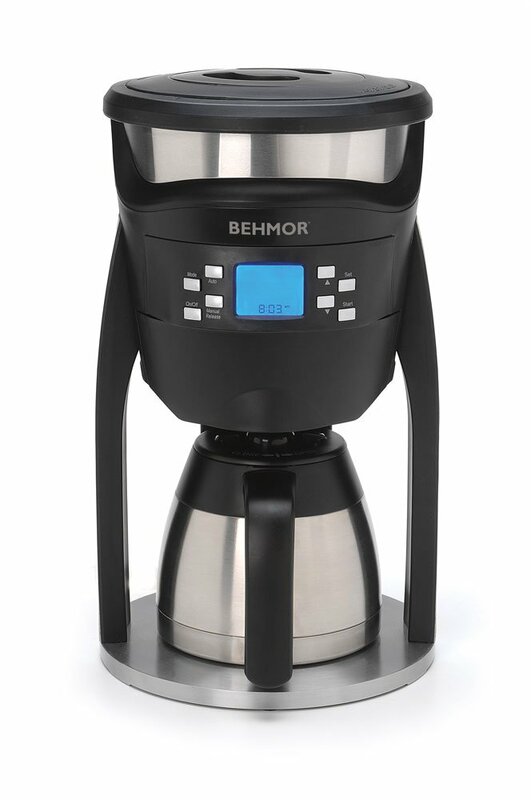 Reviewers appreciate the automatic timer, which starts once the lid is firmly closed. Cool-touch handle. It’s hard to get burned with this waffle maker thanks to handles that stay cool to the touch. 6 browning settings. Various darkness options let you choose how crispy and well-cooked you want your waffle. Outer shell gets very hot. Careful when touching the machine. Stick to the handles to prevent burns. A little heavy. Some reviewers feel the waffle maker is a bit bulky compared to others they have tried. Some reviewers find the pancake plates too small. The pancake plates produce pancakes that are smaller than the ones you might make it a pan.